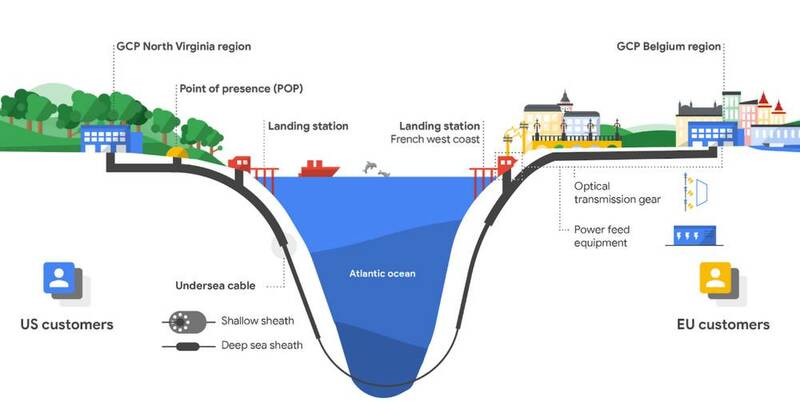 Google has announced its first private trans-Atlantic cable, with landings at Virginia Beach in the US and on the French Atlantic coast. Named Dunant (after Henry Dunant, founder of the Red Cross), the cable will go overland to follow a terrestrial link to the Chocolate Factory's cloud region in Belgium. At the US end, the cable will serve the Google Cloud Virginia region. As Google noted in its post announcing the cable, the Atlantic is home to one of the world's busiest submarine cable routes. Telegeography's submarine cable map shows 19 individual in-service or planned routes for the North Atlantic, and Google already uses capacity on six of those. The cable will be constructed by TE SubCom, and is expected to enter service in 2020. Neither Google nor TE SubCom stated the capacity of Dunant, but the builder said it will use four fibre pairs. Systems running 100 Gbps per wavelength are becoming mainstream, so the cable will ultimately be able to provide many terabits per second between its endpoints. For example, the FASTER cable which Google bought into as a consortium partner runs 60 Tbps on six pairs. Google emphasises latency rather than capacity in its announcement, saying private builds mean “we can choose this route based on what will provide the lowest latency for the largest segment of customers”. Mountain View expects the cable to have a working life of between 15 and 20 years. In separate news, Google's Cloud suffered a brief load-balancing outage earlier today, returning 502 "bad gateway" for Global Load Balancers, and various other services including AppEngine, Stackdriver, and Dialogflow.